Nicola began her competitive days on the horse in England riding race horses, she transitioned to competitive mountain biking in the U.S racing at the professional level for WTB and Proflex with her first NORBA race license in 1987. As founder and General Manager of United by Sport LLC, a management company, Nicola has developed one of the most successful programs in the U.S spanning over ten years beginning with a grass roots team to an international UCI Olympic medal winning team with a unique integrated Junior program. Teams include PROMAN, Peanut Butter & Co. TWENTY12, ExergyTWENTY12 ExergyTWENTY16, TWENTY16, TWENTY16 presented by SHO-AIR and TWENTY16 Ridebiker also under the same management, K-Edge Felt Cyclocross Team. The TWENTY16 team was the only American registered UCI professional road cycling team to win medals at the 2012 London Olympics, a gold and a silver. TWENTY16 is the top collegiate recruitment team and is the only team to have a fully integrated junior development program, and was the first U.S team to recruit Para-Cycling athletes. 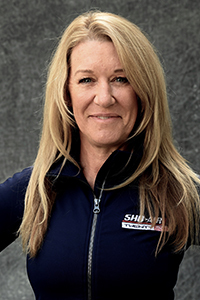 She currently serves on the USA Cycling Professional Track Committee and also served as the president of the Fairfax Chamber of commerce for 2 years, and the Team Director representative on the USA Cycling Professional Road Committee. 2016 will mark her 11th year in team management. What are some of the best and most rewarding parts about managing such a strong team of diverse female athletes and staff? Managing a team is incredibly challenging but I love to see the dedication and work ethic of the high performance athletes and also the drive of the junior athletes. The juniors make fast progress and itÕs easy to graph the positive trajectory. The high performance athletes are looking at incremental gains and thatÕs really rewarding to see them find them and transfer that into success on the bike. What are some of the most difficult aspects of managing a professional womenÕs team? Sponsorship and media exposure are two daunting constant challenges in womenÕs cycling but with Brian Cookson's leadership at UCI, I'm encouraged that the UCI Women's Commission will be a true change agent and spur the momentum in women's cycling, the advent of the WomenÕs World Tour will bring extended media coverage, therefore providing media impressions and a more traditional return on investment. There is nothing but opportunity in womenÕs cycling right now! What are your ultimate goals/overall vision for the future of the team? The sport? I will continue to operate the team through Rio 2016 Olympics, after that the program may see some significant changes but TWENTY20 sounds pretty sweet and I already have the URL registered in anticipation of continued success. The next year will determine the course of the program. ItÕs my goal to continue to support womenÕs cycling at the highest level, but also expand on the junior development team which also allows for high priority given to the junior scholarship program. TWENTY16 has a strong focus on development and preparing girls for Olympic/world level racing. What sets this team apart in terms of development? TWENTY16 is the only professional team with a truly integrated junior program. We offer the top junior athletes the opportunity to race in high profile events along side the pro athletes. This really speeds up the process of development and also keeps the pro athletes on their toes as there is some fantastic emerging talent. In support of the high performance athlete, TWENTY16 offers the professional athlete more latitude to script their own season with a focus on the long term goals such as World Championships and Olympics. TWENTY16 is a valued recruitment platform for young athletes heading to college. Several Universities are now offering full scholarships to capable female cyclists. We have been able to successfully develop these junior athletes and connect them with colleges as they graduate from high school. TWENTY16 enables these athletes to race with our professional program while attending college and fulfilling collegiate race obligations. This allows for an easier transition to full-time professional racing after graduating. The priority for our program is academics to allow our athletes to obtain the best education possible. The female endurance athlete develops much later than the male athlete, so very often a college education has already been secured before embarking on a professional cycling career. Balance is always encouraged on the team, home, school and athletics. If you weren't managing this team, where would you see yourself? I hope to see the program become a sustainable entity with a focus on the recently launched education programs and junior development camps but also high performance camps. I really do enjoy what I do so it will always be some sort of extension on this. Who or what has been an inspiration to you in your life? My parents were both involved in the sports industry in UK, my mum with the F.A (Football Association) and my dad was a professional football player but also played cricket and rugby. So sport was such a part of our life it seemed natural to be involved. Kristin Armstrong is also such an inspiration, IÕve learned a lot from her, Barry Bonds motivates me and provides a new level of accountability and I am inspired by anyone who is driven to be the best. Your favorite things to do when not managing the team? I love creating collages but have not made time in years - that will change!